I'm not sure you all remember, but last off-season about this time I talked up Columbus. I liked Federico Higuaín a lot more than was healthy (I've since sought help—only to run away) and low and behold I stumbled across a pretty good (read as: lucky) prediction. This year we all know about Will Trapp, Higuaín is still Higuaín, Steve Clarke may be a top-three keeper in MLS and they've got perhaps one of the most underrated defenses of MLS. Oh, and they added a bunch of pieces too. Gregg Berhalter is back in 2015 and contrary to last season, people aren't questioning his peculiar methods and tactics. Last year he pushed his full back hard into attacking areas, focused on wing play, and did it all by possession based soccer through the middle and allowing a 20-year old to pick out passes to his attackers down field. The result saw much of his team grow from potential into a systematic and fundamental line-up that flourished immensely under that tutelage. His ability to not just find 'MLS guys' and fit them into his system, but to plug and play the lineup when needed and to even lose guys like Alavaro Rey, and Giancarlo Gonzalez along the way shows his ability not just as a manager, but also as someone that has a keen insight into his players. Berhalter, in just 15 short months, has taken a club that looked to be on a very sharp declining trajectory after the 2013 season and injected them with new life that saw them take third in the East in 2014 and reached the playoffs after two seasons of missing out. For now, forget about what happened in the playoffs and the dismantling they took at the hands of Lee Nguyen and company. This is a coach that showed his team should be taken seriously in 2015. Steve Clark was always someone that sat on the periphery of American Soccer, succeeding over in Norway with Hønefoss BK, a team he help get promoted to the Tippeligaen and then watched be relegated the year he left. While he was a returning US international, he was a quiet returner and there were some, such as myself, that may have questioned whether Andy Gruenebaum's exodus was fair. That being said, Clark had an outstanding year being credited with saving nearly six goals more than should have been expected. Clark's advanced numbers such as available 90, reach 90 and height 90 all closely mimic that of the season Bill Hamid had, but with more shots on goal. 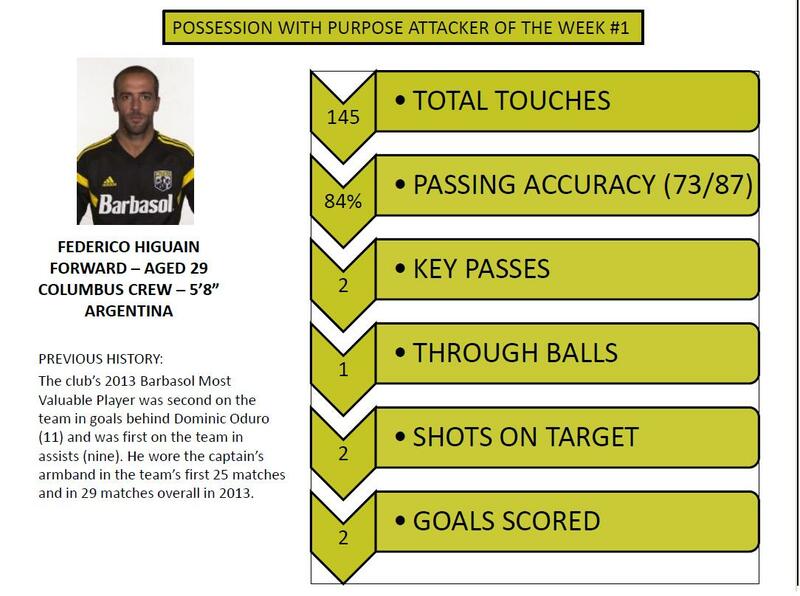 Much like how Hamid's accomplishments were questionably attributed to the DC United Defense, much of Clark's performances are heaped upon the Crew's defense—though with much more validity. Columbus posted both below average shots against and shots on goal per match. Additionally, his Dist10, which is The 10th percentile distance to goal (in yards) for shots faced, was in the bottom-three among starting keepers. 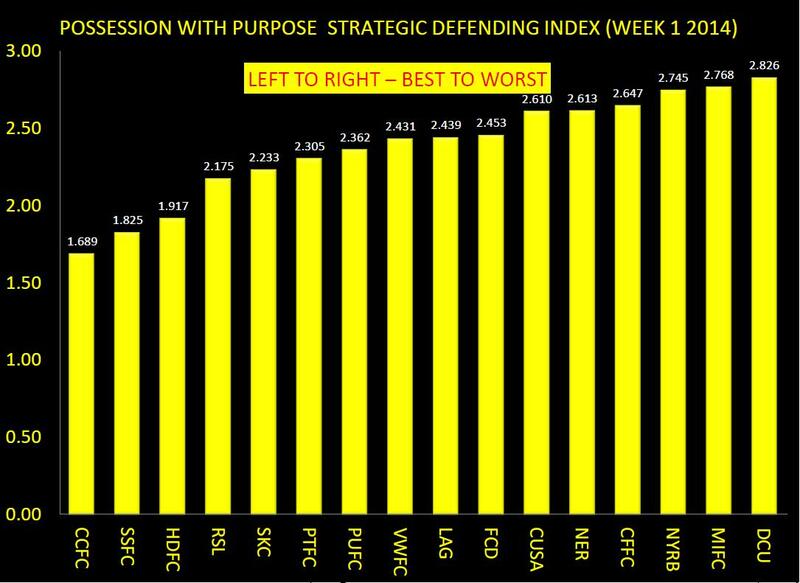 An easy way of saying this is that Clark had a good year and was further helped by having a good defense. It's extremely difficult to say what this 2015 season has in store for him, but as of right now I'd put him as a candidate for Keeper of the Year. The defense was good in 2014, and it's possible it got even better in the offseason. While he has been great for them, the Crew may have the chance to upgrade Tyson Wahl at centerback. 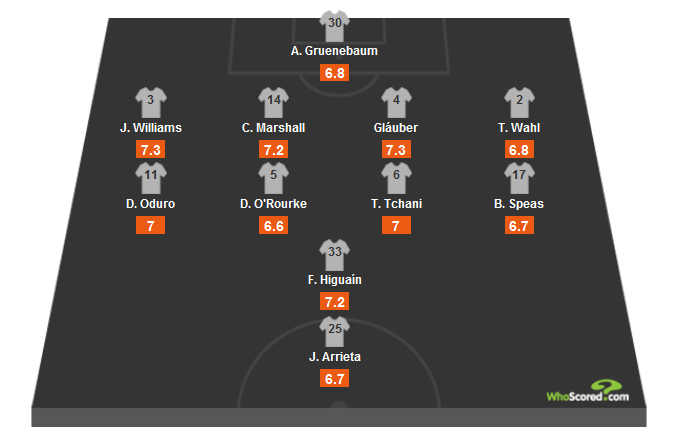 It's not that Austrian Emanuel Pogatetz wasn't around at the end of last season (remember how well Berhalter did at actually providing leadership rather than simply managing) so much as it was just not the best timing to shake up the starting lineup with Wahl performing well. This offseason, “Pog” aka Mad Dog didn't leave Columbus but stayed and trained and focused on being a member of Crew SC, which is an incredibly encouraging sign of someone that not only wants to be at the club but wants to do well. Pogatetz will likely have the starting job this season with Wahl as depth, and he'll be coupled with Michael Parkhurst. I've never been a huge Parkhurst fan myself, and his sub three duels won p90 along with the rate at which he won headers (45%) raises further questions. But should Clark be able to dominate the aerial challenges when they come, every thing should be fine. The biggest story to coming out of the offseason for the defense is who starts at fullback. Waylon Francis and Hernan Grana would typically start, but through a series of fortunate events during the MLS SuperDraft they landed Chris Klute, too. All three are capable of starting at fullback, with Klute capable of being played on either side. Just one year ago Klute produced a 3.69 expected assists (xA) from the left full back position. Likewise, Francis posted a 3.18 xA in 2014. It should be a tough decision all the way around. I'm not sure what to say about the midfield besides that it's one of the most gifted and deepest in MLS. Toni Tchani, Justin Meram, Ben Speas, Hector Jimenez, Ethan Finlay, Wil Trapp, Romain Gall, Kristinn Steindorsson and, yes, even Kevan George have starting XI potential in this group. While it's pretty simple that Tchani and Trapp will have the middle on lock down, the outside wide-positions are less certain. Trapp is amazing and I don't think there is anything more that I want to say on the subject of him except I can't wait to see what he does another year older. Tchani is a duel winning machine (5th in total duels won, with 203) and pairs brilliantly with Trapp in the midfield. Looking outside, Meram will start the season with a suspension and thus probably give way to Steindorsson for at least the first match. Despite all the love that people have given Meram this off-season, it's Finlay that has my attention. His 10 expected goals with change compiled in only 1800 minutes is impressive and I'm very interested in seeing him get more time this season. Beyond a flash of the obvious, Gall (who was loads of fun to watch during the U-20 CONCACAF tournament) along with Speas and George will push their counterparts for playing time. Anyone that knows me or listens to the podcast is probably pretty familiar with my love of Federico Higuaín. Is he a midfielder? Is he a forward-type? False nine? Who cares? I put him in the forward category and I'm sure someone on Reddit is going to rip me for it. Whatever. My bottom line: Higuaín makes goals happen, pure and simple. Let's just take a moment not to care how we define it. We have a data set with four years of data, and despite only playing three of those seasons, Higuaín finishes 12th overall in total expected goals created (46.58). Which is bananas. His shot-to-key pass ratio, which gives us a small bit of insight into whether the individual is inclined as a shooter, a balanced creator, or simply a provider, is heavily in favor of him creating shots (0.78). That being said he's still accumulated 25 expected goals scored over 6,000 minutes. Again, this is bananas. 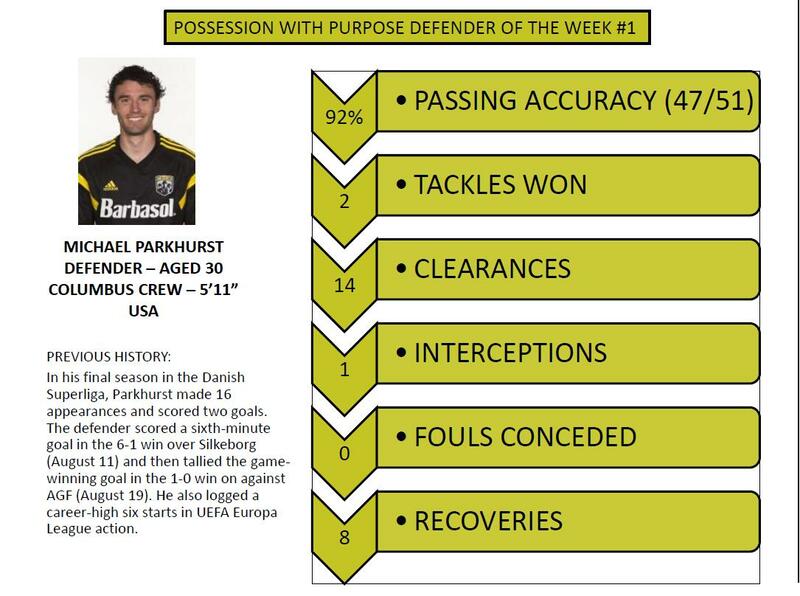 These are video game type numbers and it only serves to prove he's easily a top-five player in MLS. In years past, Higuaín has either worked underneath a striker or teamed with one that takes a volume shot approach to scoring. Basically they take everything that Higuian gives them and try to make something out of it. Guys like Jairo Arrieta and Dominic Oduro have not been to the liking of Berhalter for one reason or another. I'm not against the idea of quantity over quality as it's not necessarily a terrible approach, considering the base level finishing skills by the average starting striker in MLS. And I'm not convinced either Arrieta or Oduro were terrible experiments. I have long toyed with trying to figure out what happened to Arrieta in Columbus and if he was misused or underused or what. Oduro gets a bad rap, but he contributed 47 goals out of an expected 45 over 9,400 minutes the last four seasons. He's done this with four different teams (now a fifth) while being pushed and pulled between midfield and striker. I'm a fan and I think Montreal got a very good player on the cheap. 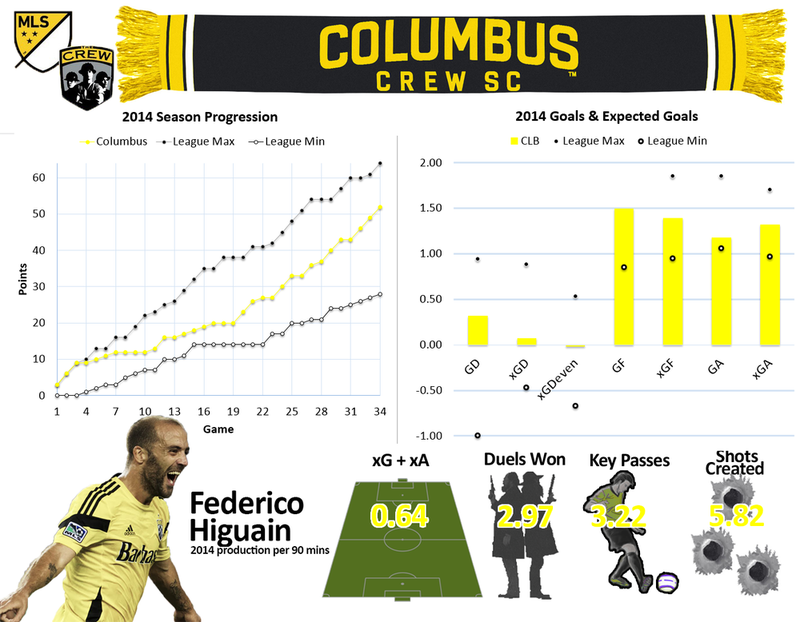 Looking to 2015, Berhalter and company look to partner Higuaín with Kei Kamara... we think. Most people seem to continue thinking Kamara can't play striker because he was largely used a wide forward during the past few years. I don't think it matters what he did previously in Columbus because Berhlater has used him up top in the pre-season, and most pundits believe he'll continue to be used in that role. It makes sense. The scary thing for Crew fans is that Kamara has shown worse shot positioning during his time with Sporting KC than either Arrieta or Oduro, though that's possibly more to do with the position and role he was fulfilling. Looking at our data set (so excluding the likes of Kaka, David Villa, ect), Kamara finished 10th* in expected goals for this season, contributing 15 total goals. Additionally, I have a strong feeling that one of Aaron Schoenfeld or Adam Bedell will have some big performances. Both are well liked by the minimal data that we have and having a guy like Higuian that can put them in great positions to take shots only amplifies the likelihood of their success. I also feel the need to reference Sagi Lev-Ari, who I know nothing about besides his history playing at California State Northridge and being born in Haifa, Israel. It'll be interesting to watch his young career. 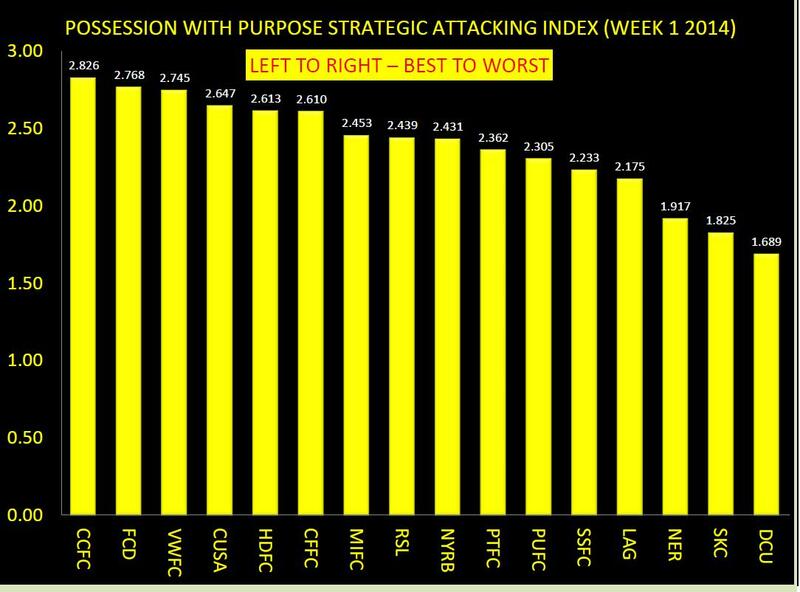 Last season Columbus was an average attacking team. Largely lead by Higuaín, the emergence of Finlay, and a bit of luck, too. Their expected goals was only 1.39 per game, tied for ninth with New England. The addition of both Kamara and Steindorsson should hopefully bring more offense over the next year and with more time for the club to meld it could all lend to some really positive results. That being said, the club was led to a third place finish because of their defense and on pure talent weren't the third best team in the Eastern Conference. Their expected goal difference in even game states was actually in the negative, and could indicate that the nice narrative I gave at the beginning of this introduction might be a bit skewed. The club held 54% possession and turned that into 12% possession in the attacking half. They took the fight to their opponents with a possession in the final third ratio of 1.13, meaning they averaged more control in the attacking in than their opponents did on the opposite end. So who knows. Overrated? Underrated? Maybe just rated? The Crew have the potential to take the number one seed in the East, and really, they probably could even be a dark horse for the Supporter Shield. But while I'm a huge fan of a lot of the parts and coach Berhalter, I feel that something a bit more down to earth is in store for this season. 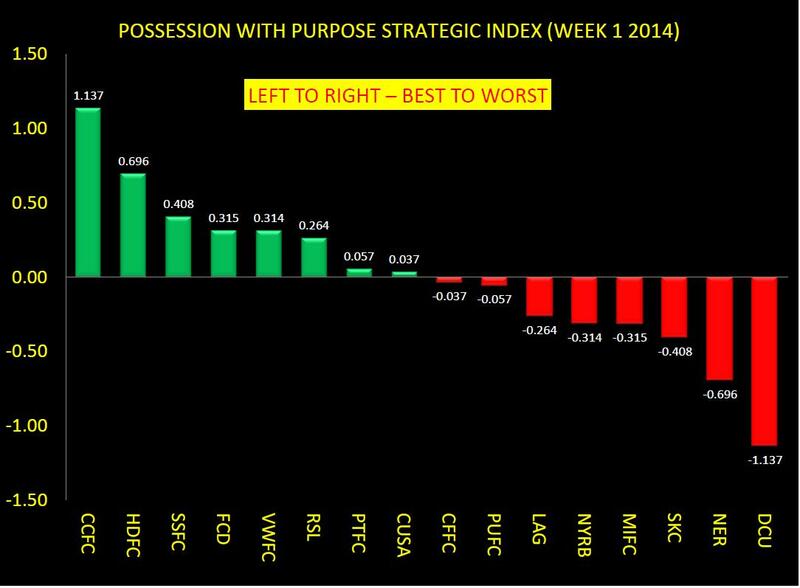 My guess they regress to the mean on their expected goals and end up fourth in the East. *I excluded Diego Valeri from this data set for a couple reasons, first because we're not really sure when he'll return this season and second because at this stage I don't project him to play 2500 minutes.